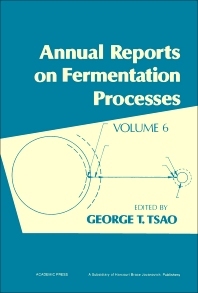 Annual Reports on Fermentation Processes, Volume 6 focuses on the significant developments in fermentation processes. This book discusses the application of immobilized living microbial cells, aerobic high-rate process for concentrated wastes, and large-scale cell culture technology. The gas-liquid mass transfer fermentation step, aeration devices, relative motion of cells and medium, and enzymes of industrial interest are also elaborated. This text likewise covers the microbial sensors for waste waters control, ventures in yeast utilization, and advances in D-xylose conversion by yeasts. Other topics include the effect of high energy radiation on lignocellulose, interaction between the solid substrate and the enzyme, and control and operation of fed-batch processes. This volume is valuable to students and researchers aiming to acquire knowledge of fermentation research and developments.